Christmas has always been a busy time of year for football players and supporters alike. With so many games crammed close together it can be the make or break of a club’s season. 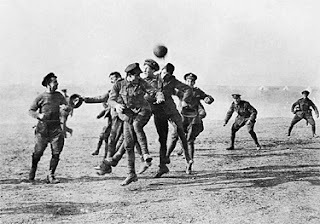 Possibly the most famous football match to have taken place at Christmas was played in the icy mud of No Man’s Land on 24th December 1914 when British and German soldiers laid down their weapons and faced each other during a short armistice. Eye witnesses talk of the soldiers sharing drinks and cigars as well as playing a football match with as many as a hundred players in each team joining in the historic ‘kick-about’, another tale of football bringing people together in the wake of political madness. Unfortunately many senior officers were so incensed by the actions of their troops that they ordered any repeat would result in soldiers being shot for fraternising with the enemy. Until the late 1950s English League football still took place on Christmas Day. The final fixtures took place in 1959 when Blackburn Rovers beat Blackpool 1-0 in the First Division and Coventry City defeated Wrexham in a Third Division thriller that ended 5-3. Christmas Day fixtures in Scotland continued until as recently as 1976, although many clubs switched matches to the 24th, 26th and 27th December due to reluctance to play and bad weather conditions. However two fixtures survived as Clydebank drew 2-2 with St Mirren and Alloa Athletic defeated Cowdenbeath by the odd goal in three. In December 1983 Brentford attempted to move their Boxing Day fixture with Wimbledon back twenty-four hours in order to attract more spectators. Many supporters of both clubs stated that they would not attend a Christmas Day fixture so it was moved back another day to Christmas Eve. Wimbledon triumphed 4-3 in front of more than 6,000 fans. My team Southend United played no fewer than twenty-two matches on the 25th December between 1920 and 1957. In 1931 Southend played Exeter City on Christmas Day before travelling west for the return fixture 24 hours later. This is quite incredible when you consider the mileage and the lack of transport methods available to the clubs. Exeter won both matches with around 22,000 supporters witnessing the two fixtures. Without doubt the players of both Southend and Exeter would not have seen too much of families and loved ones over the festive period of 1931 due to travelling etc. It makes me sick to the stomach to think that today’s Premiership overpaid underachievers want a mid-winter break to save them from burning out. What with the money they are paid we fans should be able to demand that they play football every day of the year! If this particular sequence of results were not strange enough, the return matches played two days later were quite extraordinary. West Ham, who had lost 2-8 at home to Blackburn, travelled north and won 3-1, while Manchester United beat Burnley 5-1 at Old Trafford only 48 hours after the Clarets had walloped them 6-1! Christmas had clearly taken its toll on Ipswich, who lost by double figures at Fulham. However by the time they met on the 28th December the hangovers had gone and Town won 4-2!